In these worksheets the multiplication of two 2-digit numbers (both factors of 10) is practised. 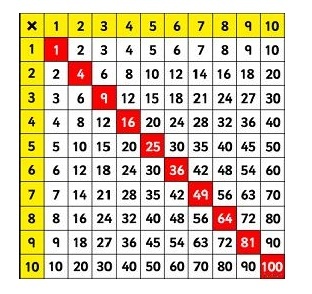 Having learned their times tables, children will quickly realise that if they multiply the tens value of each number and add a couple of zeroes to the result (since 10x10=100), they will get the right answer. n these worksheets a 3-digit factor of 100 is multiplied by a 2-digit factor of 10 or a 3-digit factor of 100. As with the easier Multiplication T0 x T0 Worksheets, and having learned their times tables, the only difficulty children will have is getting the correct number of zeroes in the answer. In these worksheets numbers of less than 100 are to be divided by a number from 1 to 9 resulting in a whole number answer. In these worksheets the child has to work out the number in the middle of the two supplied four-digit values. In these worksheets the child has to work out the number in the middle of the two supplied three-digit values. In these worksheets the child has to work out the number in the middle of the two supplied two-digit values.